Whilst Twitter does not publish actual user numbers, they have released some Twitter usage statistics for share of web traffic. 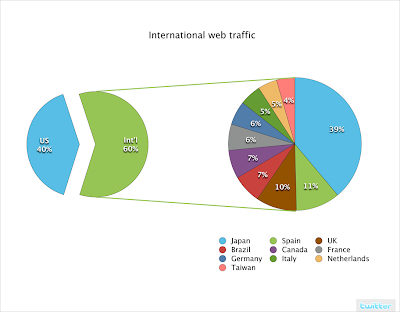 These Twitter statistics are only based on web traffic and do not take into account mobile use, however the fact that 60% of Twitter web traffic is outside the US (with 39% from Japan) demonstrates how widely Twitter is being used. With Twitter now launching in India numbers will no doubt increase again! Another way of visualising this is through the TwitterVision (http://twittervision.com) mash-up. It shows Twitter updates in realtime on a world map or globe. Interesting to watch and gives a good perspective of how widely Twitter is being used.